Screenshot from I’ll Drink To That! channel on SoundCloud. As part of our celebration of Washington Wine Month in August, I’m reviewing some of the resources that folks can use to learn more about Washington State wine. For this edition of Geek Notes, I’m encouraging readers to check out Levi Dalton’s I’ll Drink To That! 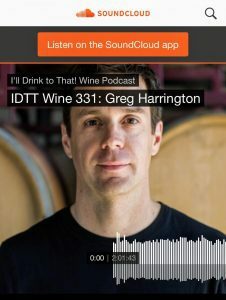 podcast episode 331 featuring Washington winemaker and Master Sommelier Greg Harrington of Gramercy Cellars in Walla Walla. To listen to the full podcast on Sound Cloud click here. Harrington also makes some great points about how his experience working in restaurants taught him how to run a business (a “MBA in a box”) (1:48:32 mark) with skills that he still uses in his winery today. The whole episode is well worth a listen but at around the 1:10:00 mark, Dalton and Harrington turn their attention to the Washington side of his story. Some Washington-related items I learned from this podcast. (1:16:40) While Harrington bought at a really good time in the mid 2000s, he still thinks there is about 10 years (from 2017) left where buying vineyards in Walla Walla is still a good financial decision. While Grenache has huge potential and promise in Washington State, we still have a long way to go before we can reap the benefit of old vine plantings like this Grenache vineyard at Charles Melton Winery in South Australia. 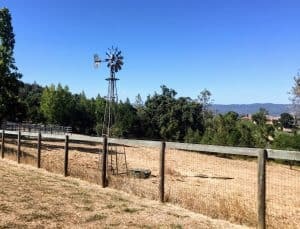 (1:19:42) Harrington thinks Grenache offers a lot of potential but the freeze of 1984 killed nearly all of the Grenache that was previously planted in the state so the grape is being rethought now with new plantings in new locations. (1:20:25) Whites in Washington don’t seem to excite Harrington as much as the reds though he is intrigued at the potential of the Columbia Gorge for white wines like Sauvignon blanc and even unique varieties like Trousseau gris and Fiano. Very interesting commentary especially considering how delicious Gramercy Picpoul is. (1:22:43) The “blessing and curse” of Washington is its long growing season with Harrington noting that Syrah could be harvested in some vintages anywhere from September 1st to November 1st, producing a wide variance of style in the same year. Harrington notes that Gramercy is usually among the first in all their contract vineyards to pick Syrah. Located on the eastern edges of the Walla Walla Valley, the Forgotten Hills Vineyard is very cool climate site that is usually harvested later in the season. (1:23:50) A really great explanation of the frost issues that can impact Walla Walla as well as what actually happens to the vine when it is damaged by frost. Super geeky and one of my favorites tidbits from the podcast. (1:25:30) “Syrah likes a view” with Harrington preferring higher altitude vineyards above 1300 feet including the Les Collines Vineyard. (1:26:17) Harrington talks about both the positives (the aromatics) and negatives (too high pH) of fruit from the Rocks District. He prefers to use Syrah from here as “salt & pepper” seasoning for blends. (1:27:03) He is also a big fan of Red Willow Syrah and considers that vineyard to be one of the premiere areas in the state for the grape. (1:28:19) The benefit of fermenting with the stems with Syrah and answering the myth about using “green stems”. Really informative section! From here the podcast gets into a lot of geeky winemaking stuff about dealing with reduction, volatile acidity and native fermentation that isn’t necessarily Washington-centric but definitely worth listening to. (1:34:33) Dalton asks Harrington if Syrah from Washington is less reductive than Syrah grown elsewhere. Harrington gives a very interesting answer and notes that perhaps the fact that Washington vineyards and wineries here tend to use less sulfur treatments on the grapes and in winemaking could play a role. 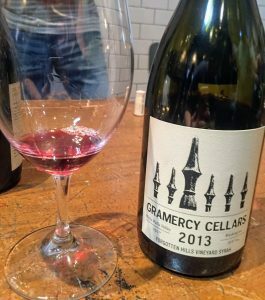 He also notes that all of Gramercy’s estate vineyards are organic. 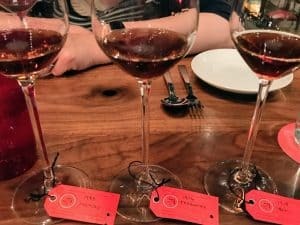 (1:38:40) Harrington thinks the drinking curve for Washington Syrahs starts at around 5 years from vintage date while Cabernet Sauvignon tends to be more approachable younger after around 2 years in the bottle. He also feels that Washington Cabernet Sauvignon tends to be soft and needing tannin. The warm climate, steep aspect and poor sandy soil of the Alder Ridge Vineyard in the Horse Heaven Hills seems to be particularly well suited for Mourvedre. (1:42:01) Among Washington vintages, Harrington is very high on the 2007 and 2010 vintage as among the best in Washington. 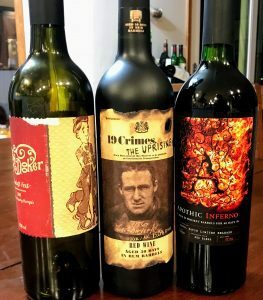 Both 2010 and 2011 were very Old World-style vintages. 2012 was a great Cabernet Sauvignon vintage but not as much for Syrah. (1:43:26) Harrington is high on Mourvedre in Washington but it needs to be planted in spots warmer than areas like the Rocks District in Oregon. 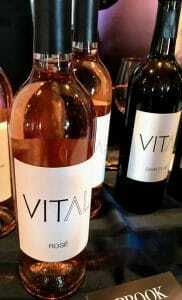 He cites Olsen Vineyards in the Yakima Valley and Alder Ridge as promising vineyards for the grape. (1:45:50) Dalton asks how often Washington winemakers look to the Old World for inspiration with Harrington encouraging more winemakers to explore the classic wines of the Old World. Tagged Alder Ridge Vineyard, Bellagio, Cabernet Sauvignon, Charles Melton Winery, Chateau Petrus, Columbia Gorge, Emeril Lagasse, Fiano, Forgotten Hills Vineyard, Frost damage, Gramercy Cellars, Greg Harrington, Grenache, Horse Heaven Hills, I’ll Drink To That!, Joyce Goldstein, Les Collines Vineyard, Levi Dalton, Master Sommelier, Mourvèdre, Native fermentation, Olsen Vineyards, Organic viticulture, Picpoul, Red Willow Vineyard, Reduction, Sauvignon blanc, SoundCloud, Stephen Hanson, sulfur, Syrah, The Rocks District, volatile acidity, Walla Walla, Washington vintages, Washington Wine Month, wine podcast, Winemaking, Wolfgang Puck, Yakima Valley.